CNN says it will provide extensive coverage of the Super Tuesday caucus and primary votes today. Full details from CNN's press release below. As the proven destination for politics across all platforms, CNN plans extensive coverage of the Super Tuesday caucus and primary contests on March 6. Anchors Wolf Blitzer, Anderson Cooper, Erin Burnett, John King and Candy Crowley will headline the network’s America’s Choice 2012: Super Tuesday special programming from the CNN Election Center beginning at 7 p.m. ET. Gloria Borger and David Gergen, along with CNN political contributors Donna Brazile, Ari Fleischer, Hilary Rosen, Erick Erickson, Paul Begala and Alex Castellanos, will join the coverage to provide analysis and insight. Beginning at 1 a.m. on March 7, the network will air a live special edition of Anderson Cooper 360º. On CNN.com, viewers can join Wolf Blitzer, Gloria Borger, Jessica Yellin, Ari Fleischer and Donna Brazile to get an insider’s take on the 2012 presidential election. Users may register at CNN.com/roundtable for a 12 p.m. live virtual roundtable on Super Tuesday powered by Cisco's WebEx. 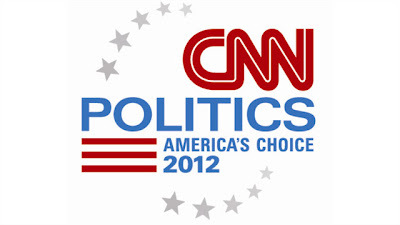 The panel of political experts will address election centric questions from registered participants and CNN iReporters. Correspondent Tom Foreman will take viewers inside CNN’s new “virtual convention floor” on Tuesday evening. The virtual representation of the floor at the Republican National Convention will look ahead to the GOP gathering in Tampa less than six months from Super Tuesday to evaluate what is at stake in the race and provide visual delegate updates as they develop. Anchor and chief national correspondent John King will utilize the “Magic Wall” to break down the Super Tuesday battlegrounds and analyze exit polling data. To engage and comment on election news as it happens, users can view the CNN Politics Facebook page for political stories and photos of CNN’s favorite faces. On Twitter, users may follow @CNNPolitics for breaking developments and join the conversation by using hashtag #CNNElections. CNN anchor Brooke Baldwin will report live from the CNN Election Center on trends and conversation across social media. CNN anchors and correspondents listed below will fan out from Alaska to Massachusetts and points in between for on-the-ground coverage of key states and races. * Jessica Yellin, chief White House correspondent -The White House, Washington, D.C.
* Lisa Desjardins, CNN Radio Capitol Hill correspondent - Washington, D.C. The CNN Election Center will provide extensive coverage of the Super Tuesday states and will include live blogs and real-time results coverage. CNN.com will live stream Super Tuesday coverage online, on CNN’s mobile website and across CNN's mobile apps. Users can visit the CNNPolitics.com, the online destination 2012 election-related news and analysis. Other online features include: GOP Delegate Calculator, CNN Electoral Map, 2012 Primary Caucus Calendar and an updated CNN Polling Center debuting Tuesday. CNN en Español will offer extensive coverage of the Super Tuesday races, with anchors Juan Carlos López and Carlos Montero from Atlanta. Lopez and Montero will be joined by a panel of the network’s political contributors: Democratic strategist María Cardona, The George Washington University’s Roberto Izurieta and Republican strategist Juan Hernández. Programming will begin at 7 p.m. and will include guests and correspondents from Massachusetts, Ohio and Georgia. CNN International will simulcast the domestic network’s Super Tuesday coverage beginning at 7 p.m.
CNN Radio will provide comprehensive Super Tuesday coverage for its affiliates and digital distribution partners with correspondents and producers spread out though Georgia, Ohio, Tennessee, Virginia, Massachusetts, and Washington, D.C.